Giveaway: Win NYX Matte Lipsticks, a Lash Curler and More! Win these goodie and more if you subscribe to the blog’s email list! I have so many beauty products and only one face. God knows why I still buy so much makeup! If you had watched my latest video on my NYC Beauty Haul, you’d have seen these goodies which I’m giving away today. All of them are still brand new and most are still in their packaging (even if they’re not, I promise I have not used them at all), and I think it’s wiser to find them happy homes. After all, I might only end up using them once or twice, and then unintentionally shove them in a corner to be lost forever. Better for them to be loved by you! 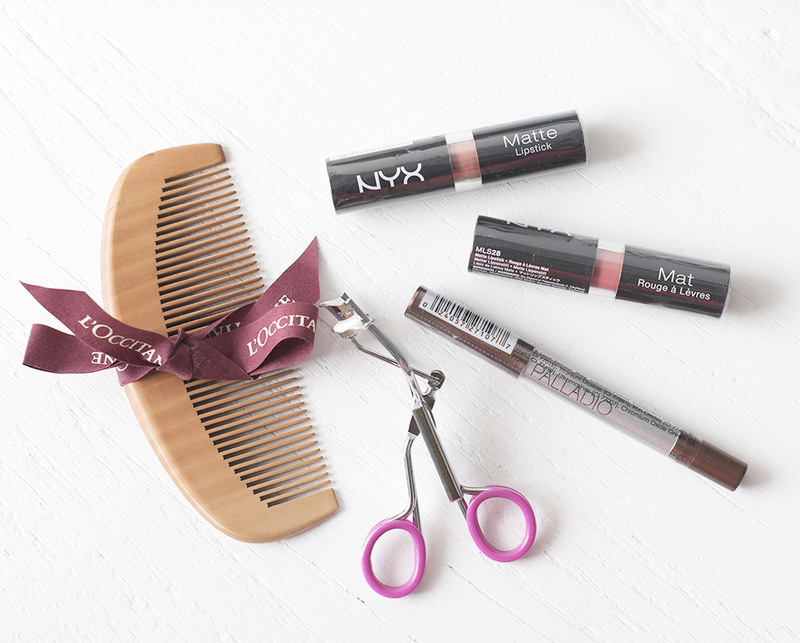 The NYX Matte Lipstick is a great start to any girl’s lip makeup wardrobe. The colours are pigmented and look like how they do in the tube, even though they don’t last. The Palladio Herbal Crayon is quite the new product to me, in that I’ve only discovered the brand last month. This shade in Expresso is a dark brown, which is very versatile for daily wear for anyone of all ages. Everything in this giveaway is great as either a mini birthday gift or a nice stocking stuffer for the upcoming Christmas season. Winning this giveaway means you probably will have one less thing to worry about! All you need to do is just to be a subscriber to the blog’s newsletter, which I send out either once a week or once every two weeks. I really don’t spam, nor sell your email to anyone. Just type in your email in the widget below and you’re on your way to bagging these goodies and more. If you’re already a subscriber, you can still type in your email address so that I’ll know you’re interested in this giveaway. Contest rules are also written in the widget below, so please take a minute to read them. The giveaway will end 26th September 2016, at 12a.m. (i.e. the night of 25th September) and is open internationally. Good luck and all the best. Giveaway: Win NYX Matte Lipsticks, a Lash Curler and More! was last modified: September 16th, 2016 by Roxanne C.
Vlog: I’ve Got my Masters! Woo Hoo!